The County of Roanoke was formed in 1838 from land that was originally part of Botetourt County. At that time, Botetourt County had boundaries extending west to the Mississippi River. In 1849, Roanoke County was extended by adding a portion of what was then Montgomery County. By the 1740's, the first Scotch-Irish and German settlers reached the upper Roanoke Valley by traveling from Pennsylvania through the Shenandoah Valley. They were joined by Tidewater Virginians of English ancestry who journeyed up the valleys of the James and Roanoke rivers. Roanoke's earliest era of pioneer settlement produced two major military and political leaders. General Andrew Lewis and Col. William Fleming lead troops from Virginia to defeat the Shawnee at the Battle of Point Pleasant on the Ohio River in 1774. Both Lewis and Fleming then served as Western Virginia leaders during the American Revolution. 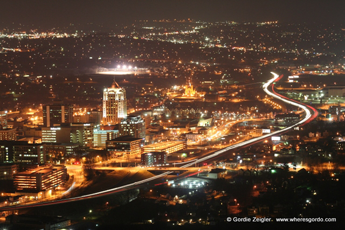 Roanoke's name comes from the Indian word "Rawenok," which means wampum. These were white shell beads worn by Native Americans and often traded as money. The origin of this name was passed down in the writings of Captain John Smith about Roanoke Island in North Carolina's Albermarle Sound. Many of the county's areas are named for its mountain peaks. One of the most unusual names is Twelve O'Clock Knob. This mountain got its name because slaves west of Salem could look at it and tell it was time for lunch when the sun was at a point over the mountain's 2,707-foot peak. Some areas got their names from underground springs, another natural resource of Roanoke County. Virginia Etna Springs, is the site of a water bottling plant. 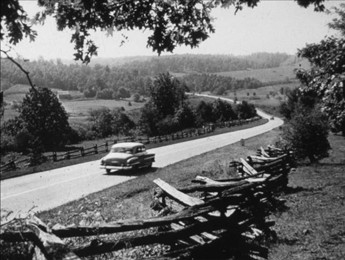 Botetourt Springs Resort began in the 1820's and became the nucleus of Hollins University. Another important spring was Big Cook Spring in Bonsack, an area heavily damaged by the Civil War. Bonsack lies East of Vinton, and was the home of Jim Bonsack. He quit Roanoke College to work on a competition for the first cigarette-rolling machine. Young Bonsack won the $75,000 competition prize, patented his invention in 1880 and made a fortune at the age of 22 while he was spawning a national industry. Today Roanoke County contains about 251 square miles, and has a population of approximately 93,000. It is located at the southern end of the famous Shenandoah Valley of Virginia with the Blue Ridge Mountains to the southeast and the Appalachian range to the northwest. The Town of Vinton, Hollins home of the prestigious Hollins University, and historic Bonsack reside within its boundaries. Roanoke County is located adjacent to the Counties of Craig, Botetourt, Bedford, Franklin, Floyd and Montgomery. It also surrounds the independent Cities of Salem and Roanoke. The Board of Supervisors is the governing body of the County. The Board is elected to terms of four years and comprises five members who select a Chairman and Vice-Chairman for a one-year term. The Board appoints a County Administrator to act as administrative head of the County. He serves at the pleasure of the Board, carries out its policies and directs business procedures. All department heads report to him, except for the County Attorney who reports directly to the Board. Roanoke County's School Board is an elected board, and the School Superintendent reports directly to the School Board. The Constitutional Officers (Commissioner of the Revenue, Commonwealth¹s Attorney, Clerk of the Circuit Court, Sheriff and Treasurer) are elected by the voters of the County and are not responsible to the Board, but work closely with the board and the County Administrator. In 1986, Roanoke County was the first county in Virginia to receive a charter, and in 1989, it was the first Virginia County to be named an All-America City.